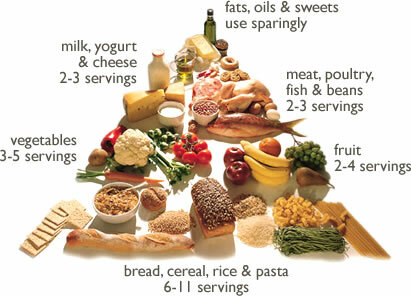 The USDA Food Guide Pyramid was developed to translate nutrition recommendations into a simple food selection guide.The design of the Pyramid was selected to symbolize the importance of a base, the largest part of the diet, and decreasing amount of food groups needed as one moves from bottom to top.Its message is relevant and it is a valuable tool for healthy menu planning. While not designed to be a calorie specific food management tool, when the food items from each group are low fat and the number of servings are kept to the minimum, Pyramid menus can provide as few as 1200-1400 calories. Amounts should total 5 to 7 ounces of cooked lean meat, poultry without skin, or fish a day. A serving would be no more than 3 ounces. Count 1 egg, 1/2 cup cooked beans, or 2 tablespoons peanut butter as 1 ounce of meat.